Atheist Ireland has used the Freedom of Information Act to examine more than 20 years of public records, describing how the Religious Education Curriculum at second level was created and delivered. What we have found is Church and State tightly entwined, in a process that overtly breaches the constitutional rights of parents and children. Documents obtained under Freedom of Information, reveal how this situation was arrived at, with the full knowledge of the constitutional rights that were being breached, by both Church and State bodies that acted deliberately to achieve this outcome. The NCCA, with the support of the Department of Education, devised and rolled out the State second level Religious Education course in the 1990s and 2000s, before and after the 1998 Education Act 1998. During their initial discussions, the NCCA and the Department recognised that legal issues had to be overcome to introduce such a course. The legal framework in place was crucial to the roll out of this course. This legal framework gives patron bodies decision-making power over the rights of minorities. The State cedes control to the patron’s interests, while relegating the rights minorities to second class status. The Department of Education initially reported that they were waiting for the judgement in the “Campaign to Separate Church and State” case and that the proposed course had to have a sound educational basis. 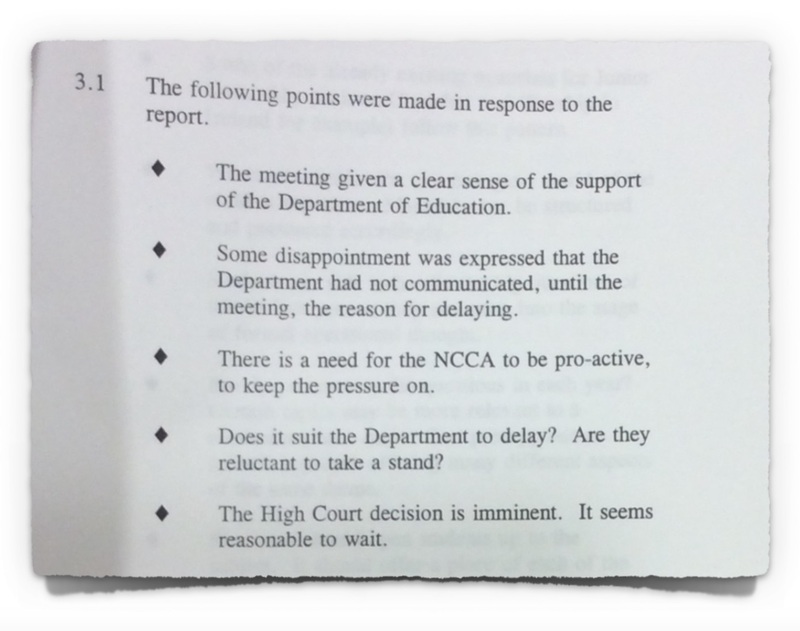 This case is the judicial review referred to in the above letter from the Department of Education to the NCCA from 10th March 1995. Up to this point, the obvious issue to overcome was Section 5 of the Intermediate Education (Ireland) Act, 1878, which prohibits the holding of examinations in Religious Instruction. Section 5 of the Intermediate Education (Ireland ) Act was removed. It is religious discrimination. This is a State examination course that does not respect the philosophical convictions of atheist and secular families (Article 42.1 and Article 42.3.2). It was never intended to provide an education about religions, beliefs and ethics. It was always going be subject to the ethos of schools, which in the vast majority of cases have a Catholic ethos, with the remainder Christian. It is combined with Catholic Religious Instruction and faith formation and is made compulsory in the vast majority of schools, contrary to the right to opt out under Article 44.2.4 of the Constitution. The main beneficiary of this religious endowment was the Catholic Church, with the financial support and prestige of the State therefore behind the Church’s efforts to evangelise and keep adherents. The issues of religious discrimination and the endowment of religion were raised by the Department of Education before the introduction of the course. This State Religious Education course is then not suitable for all students as it is not objective, critical and pluralistic. The second level state Religious Education course is not what it is portrayed to be. It is portrayed to parents as suitable for those of all religions and none, as otherwise it could be viewed as religious discrimination. However, a State exam course at Junior and Leaving Certificate that only respects the rights of religious families is religious discrimination contrary to Section 7-(2),b,c of the Equal Status Act. Contrary to its stated aims this State Religious Education examination course at Junior and Leaving Certificate is not suitable for those of all religions and none as it is not objective, critical and pluralistic. The aim of the Religious Education course is to only support a religious understanding of the world. It is not an education about religions, beliefs and ethics delivered according to human rights principles. 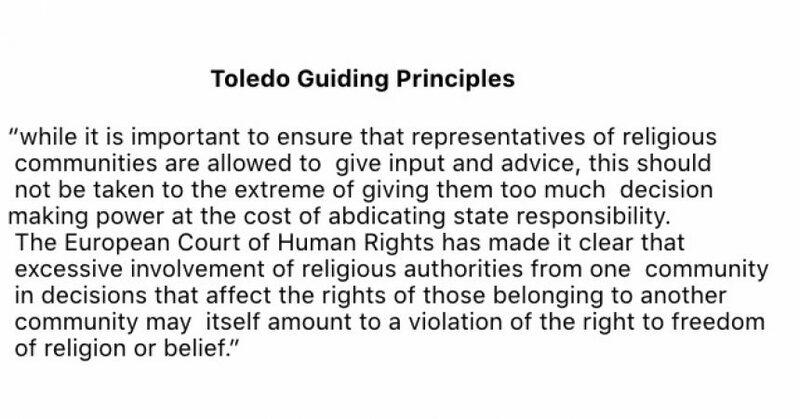 The Toledo Guiding Principles on teaching about religions and beliefs, provide an in depth description of these issues. One of the main aims of the course is to contribute to the moral and spiritual development of all students through Religious Education. It only “acknowledges” the non-religious interpretation of life. Students are assessed on their awareness of and respect for the richness of religious traditions but are only assessed on their awareness of the non-religious interpretation of life. Students are not taught to respect the non-religious interpretation of life. At Junior Certificate level, atheists and humanist are portrayed as “Challenges to faith” alongside materialism and fundamentalism. In order for the children of non-religious parents to access the course they must endure the disrespect the State has for their parents’ philosophical convictions, contrary to Article 42.1, Article 42.3.2 of the Irish Constitution, Article II of Protocol 1 of the European Convention and Article 13 of the International Convention on Economic, Social and Cultural Rights. Bearing in mind that atheists and the non-religious in general do not support a religious understanding of the world, it is not difficult to understand why they would consider that the rationale and aims adopted by the NCCA Course Committee are likely to cause their children to face a conflict of allegiance between their school’s values and their own. Atheist and non-religious parents can legitimately believe that this course will cause their children to face a conflict between the Religious Education given by schools and their philosophical convictions. In addition to disrespecting parents convictions (Article 42.1) most schools combine the course with Catholic Religious Instruction and faith formation and never inform parents that they are doing this. It seems that the vast majority of schools then make this course compulsory for all students at Junior Certificate level, when there is a right under Article 44.2.4 of the Constitution to opt out of Religious Instruction. 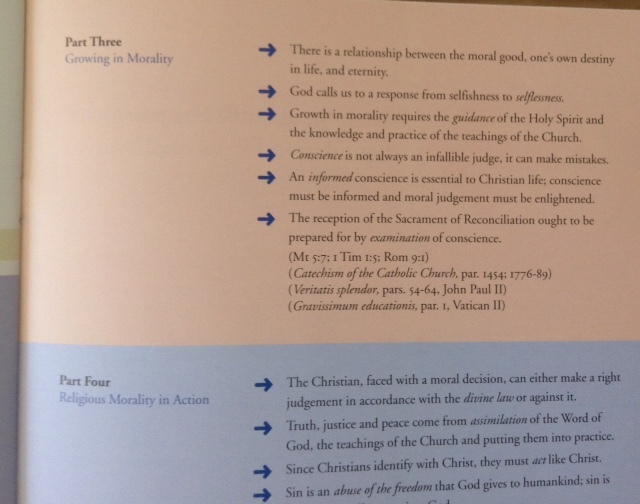 A section from the “Guidelines of the Faith Formation and Development of Catholic Students” is depicted below. This document is clear that the purpose of the course is to contribute to the moral education of all students through religion. Section 30 – 2 (e) of the Education Act 1998 gives parents the right to opt their child out of any instruction that is against their conscience. The point is that this Religious Education course is a State course and parents should not have to opt their children out of a course that was introduced by the State, is an exam course at both Junior and Leaving Certificate and that was supposed to respect all parents convictions. Even if the opt out was recognised in some schools this does not means that students can choose another subject. There was no suggestion in any of the Documents got under FOI that there would be any partial exemptions for parents and children that were not Catholic. It was always meant to be an optional course which would mean that students could choose another subject. There was no person or organisation from the NCCA, the Religious Education Course Committee or the Department of Education, to point out that you cannot promote the moral and spiritual education of the children from atheist and secular families through religious education and that the right to opt out must be recognised, guaranteed and supported. Up to this there was Catholic or Protestant Religious Instruction in all schools, this instruction was not state sanctioned and was not an exam subject at Junior and Leaving Certificate. Parents had the right to opt out their child (Article 44.2.4 / Section 30-2(e) Education Act 1998). There was never any intention to replace the religious instruction delivered by Patron bodies in schools with a State course on religious education. Unfortunately Patron bodies and schools have managed to ensure that religious instruction and formation are compulsory in nearly all schools. This religious instruction and formation is mainly Catholic and it is not confined to schools with a Catholic ethos. It is clear from the Documents released under FOI that there was Catholic Religious Instruction in Vocational schools (VECs). All ETB/VEC Community schools, Designated Community Colleges and non-designated Community Colleges have Religious Instruction (mainly Catholic) and always had. The IVEA Guidelines for Boards of Management of Vocational, Community Schools, designated Community Colleges and non-designated Community Colleges show that all these schools are obliged to have religious instruction and worship. Given the history of the Catholic Church in our education system than is mainly Catholic religious instruction. The point is that nearly all schools at second level in our Republic are forcing minorities into religious instruction, education and formation contrary to their parents convictions and the right to opt out in the Constitution. It is clear from the Equal Status Act that students from atheist and secular families should have access to the state curriculum without religious discrimination. Unfortunately this is not the case as they have not got access to a course ABOUT religions, beliefs and ethics. This is what happens when a state body the NCCA colludes with religious bodies, fails to consult minorities and puts together a Course Committee that represent the dominant religions in the education system.This is religious discrimination at its best and it has undermined the Constitutional and Human Rights of minorities. Article 42.1 of the Irish Constitution obliges the state to respect all parents convictions and not just religious parents. This right to respect is an inalienable right, despite this Christian religious bodies were given far too much decision making power in decisions that affect the rights of minorities in relation to the Religious Education syllabus at second level. The NCCA and these Christian bodies failed to recognise that atheist and secular parents have a right to ensure that the teaching of their children is in conformity with their convictions and that the state must respect that right. If Barington J’s judgement suggest that a child of a minority religion, or from a non faith background, with no choice but to attend a Roman Catholic school other than withdrawing from formal religion classes, must in effect accept a form of religious education which offends their convictions, then this would appear to elevate one form of parental choice over another, with the majority religion always dictating the outcome. This could hardly respect the rights conferred on all parents by virtue of Article 42 of the Constitution. For some reason the NCCA and the Department of Education have used the Campaign case as a basis to influence the children of atheist and secular families into a religious way of life through religious education. If we look at the words of Barrington J, it is clear that he said the exact opposite. He spoke of influencing children to ‘some degree’ if their parents choose to send them to that particular school. Parents in Ireland do not have a choice, all the schools and colleges at second level have Catholic Religious Instruction, formation and worship. There are no non-denominational schools at primary or second level in Ireland. The NCCA, the Department of Education and the Religious Education Committee believe that it is constitutionally permissible to contribute to the moral and spiritual education of the children of atheist and secular families through religious education. Atheist and secular families do not choose to send their children to schools that promote the moral education of their children through religious education and a religious ethos that informs all aspects of the daily life of the school. Atheist and secular families are coerced by force of circumstances to send their children to these schools. The Constitution obliges the state to ensure that children receive a certain minimum moral education. It does not oblige the state to ensure that all children receive a moral education based on a religious view of life. Unfortunately this is the rationale behind the introduction of the State Religious Education Course. The rationale for this State course elevates the rights of religious parents over atheist and secular parents. In addition to equating morals with only religious belief in the Rationale for the course the NCCA also equated the word ‘spiritual’ with religious belief when the Department of Education had already informed them that it did not equate the word ‘spiritual’ with religion. Section 30-2(e) of the Education Act 1998 gives parents the right to opt their child out of any instruction that is against their conscience. Parents should not have to opt their children out of a course that was introduced by the State, as an examination course at both Junior and Leaving Certificate, which was supposed to respect the convictions of all parents. Even if the opt out was recognised in some schools this does not means that students can choose another subject. At no point in any of the NCCA documents on this subject, was there any suggestion that there would be any partial exemptions for parents and children that were not Catholic. This was always intended to be an optional course, which would mean that students could choose another subject. There was no person or organisation from the NCCA, the Religious Education Course Committee or the Department of Education, who pointed out that schools cannot promote the moral and spiritual education of children from atheist and secular families through Religious Education and that the right to opt out must be recognised, guaranteed and supported. Before the NCCA defined this curriculum, there was Catholic or Protestant Religious Instruction in all schools and this instruction was not State sanctioned and was not an examination subject at Junior and Leaving Certificate. Parents had the right to opt out their child (Article 44.2.4 / Section 30-2(e) Education Act 1998). There was never any intention to replace the Religious Instruction delivered by patron bodies in schools with a State course on Religious Education. Unfortunately, patron bodies and schools have managed to ensure that Religious Instruction and faith formation are compulsory in nearly all schools. This Religious Instruction and faith formation is mainly Catholic and it is not confined to schools with a Catholic ethos. It is clear that there is Catholic Religious Instruction in vocational schools (VECs). All ETB/VEC schools, Designated Community Colleges and non-designated Community Colleges have Religious Instruction (mainly Catholic) and they always had. The IVEA Guidelines for Boards of Management of Vocational, Community Schools, Designated Community Colleges and Non-designated Community Colleges show that all these schools are obliged to have Religious Instruction and worship. Given the history of the Catholic Church in our education system, that is mainly Catholic Religious Instruction. As such, nearly all schools at second level in our Republic are forcing minorities into Religious Instruction, Religious Education and faith formation, which is contrary to their parents’ convictions and the constitutional right to opt out. This is what happens when a State body like the NCCA, colludes with religious bodies, fails to consult minorities and puts together a Course Committee that represents the dominant religions in the education system. This is religious discrimination and it has undermined the constitutional and human rights of minorities. Article 42.1 of the Irish Constitution obliges the State to respect all parents’ convictions and not just religious parents. This right to respect is an inalienable right but despite this, Christian religious bodies were given far too much decision making power on the rights of minorities in relation to the Religious Education syllabus at second level. The NCCA and these Christian bodies failed to recognise that atheist and secular parents have a right to ensure that the teaching of their children is in conformity with their convictions and that the State must respect that right. For some reason the NCCA and the Department of Education have used this case as a basis to influence the children of atheist and secular families into a religious way of life through Religious Education. Looking at the words of Barrington J, it is clear that he said the exact opposite. He spoke of influencing children to “some degree” if their parents choose to send them to that particular school. Parents in Ireland do not have a choice, since practically all schools and colleges at second level have Catholic Religious Instruction, faith formation and worship. There are no non-denominational schools at primary or second level in Ireland. The NCCA, the Department of Education and the Religious Education Committee believe that it is constitutionally permissible to contribute to the moral and spiritual education of the children of atheist and secular families, through Religious Education. Atheist and secular families do not choose to send their children to schools that promote the moral education of their children through Religious Education, where a religious ethos informs all aspects of the daily life of the school. Atheist and secular families are coerced by force of circumstances to send their children to these schools. The constitution obliges the State to ensure that children receive a certain minimum moral education. It does not oblige the State to ensure that all children receive a moral education based on a religious view of life. Unfortunately, this is the rationale behind the introduction of the State Religious Education course. The rationale for this State course elevates the rights of religious parents over atheist and secular parents. In addition to equating morals with only religious belief in the rationale for the course, the NCCA also equated the word “spiritual” with religious belief when the Department of Education had already informed them that it did not equate this word with religion. The Department of Education made clear to the NCCA Course Committee that it did not equate the word “spiritual” with religion and this was recorded within NCCA Course Committee meeting minutes, on 30th January 1995. The State does not equate the word “spiritual” with religious belief and in addition, they are not obliged to ensure that all children receive a moral education through Religious Education. Some of the aims expressed in the rationale for the course represent positive aims, which atheist and secular families could relate to. Unfortunately, the Religious Education syllabus simply does not achieve those aims because it disrespects the philosophical convictions of atheist and secular families and discriminates on religious grounds. If the aim of any course was to contribute to the moral and spiritual education of all children through atheist education, then we would have religious bodies stating that the rights of families from religious backgrounds are being undermined. It is difficult to understand how the NCCA and the Department of Education can believe that contributing to the moral education of the children of atheist and secular families through Religious Education, would not be considered as against their conscience. We now have all schools promoting the moral and spiritual developments of the children from atheist and secular families through Religious Education. If the purpose of the NCCA Religion Course Committee was to respect the rights of all parents they would have ensured that the human rights of all were respected and guaranteed. Disrespecting the philosophical convictions of atheist and secular families is pursuing an aim of indoctrination. The NCCA showed a deference to the Catholic Church while ignoring minorities and disregarding their their right to respect for their philosophical convictions and to ensure that the teaching of their children is in conformity with their convictions. Even partial exemptions from the areas that are combined with the “Guidelines for the Faith Formation and Development of Catholic Students” will not suffice to protect and respect the rights of minorities. Atheist Ireland briefs and addresses international human rights bodies that monitor Ireland’s obligations under human rights treaties. In recent years, nine separate reports from United Nations and Council of Europe Human Rights bodies have told Ireland that it is breaching the human rights of atheist, secular and minority faith parents, children and teachers in Irish schools. Atheist Ireland has a policy called the Schools Equality PACT (an acronym for Patronage, Access, Curriculum and Teaching) that outlines the legal changes needed. Bizarrely, the Irish State claims it is constitutionally obliged to allow State-funded schools to discriminate against parents and children in this way. (b) schools should actively inform students and parents about this. any information with regard to religion and belief should be delivered in an objective, critical and pluralistic manner that avoids indoctrination. (e) the revised course after the review should have to meet at least the same constitutional and human rights standards as are included in the NCCA’s plans for the proposed new course on Religion, Beliefs and Ethics course at primary level. 4. The Minister for Education should ensure that students from minority backgrounds can have access to teacher training, and have access to the teaching profession, without having to teach Catholic Religious Instruction and Formation. (c) in the four areas covered by the Atheist Ireland Schools Equality PACT — Patronage, Access, Curriculum, Teaching.